Volume leads price is a well-known market mantra. Essentially, it means that stocks tend to go up on rising volume and down on falling volume. Recently, we have been asked whether the decline in general market volumes over the past five years implies the new highs being seen in certain stocks, and the US market in general, suggests caution. As shown in the table, market volumes generally have been going down since well before the equity market highs of 2007–2008. 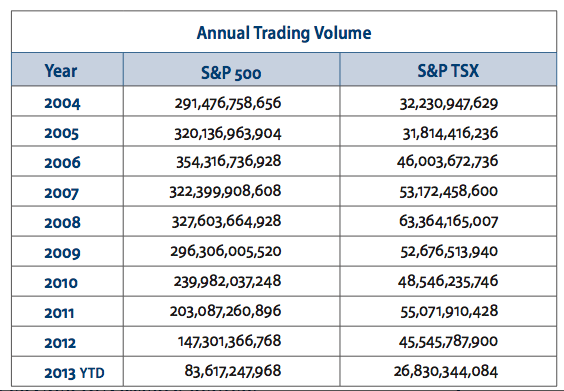 Whether a broad market, such as the S&P/TSX or S&P 500, or a specific stock, trading volumes today are generally lower than the volumes seen prior to the market collapse of five years ago. We believe a significant contributor to the general decline in volume activity is an unwinding of a computer-driven trading strategy commonly referred to as “High Frequency Trading” or HFT, which has accounted for well over half of US trading activity in recent years. As computers have replaced people in the order execution process, “smart” trading algorithms have been developed by PhD mathematicians to clip fractions of pennies off of millions and millions of trades a day. Defended by adherents as “providing market liquidity – look at all the volume,” HFT appears to be waning as stricter regulatory oversight, reduced volatility and decreased profitability all take their toll. Portfolio managers, by and large, are less concerned about volume than they are about liquidity. Defined as the ability to enter or exit a stock position without significantly impacting price, the liquidity cost of trading has a real impact on portfolio results. The greater a stock’s liquidity, the tighter the bid/ask price spread, and the cheaper the ultimate cost of a trade. Liquidity providers (i.e. the HFT group above, brokers, derivative players) can reduce the bid/ask spread, but the spread doesn’t go away. Small-cap stocks are notoriously illiquid, and hence, are considered more risky than large-cap stocks. As anyone who has recently tried selling 5,000 shares of a Venture Exchange mining stock will attest, one very seldom receives the price they saw on their portfolio valuation the night before! Emerging markets, from which one cannot emerge in an emergency, are notoriously illiquid. The more liquid the market, the more trading activity the market will enjoy. With most of Canada’s largest companies inter-listed on US exchanges, the lack of liquidity in Canadian names is not to be ignored. It is always fascinating to see how much Canadian trading in large cap names dries up when the United States is on holiday. The converse is much less obvious on Canadian holidays. Dual-listed Canadian retail innovator Lululemon’s June announcement to delist from the Canadian stock market was a direct result of the relative illiquidity of Canada compared to the US Nasdaq market. At the end of the day, the ultimate determinant of liquidity is a strong investment case. As we saw in March 2009, at the trough of the market when intermediaries were long gone, the first stocks to emerge were the dividend-payers with good balance sheets. With dividend yields the highest they had been in decades, the investment case for blue chip names was simple. In other cases, the companies themselves provided market liquidity through share buy-backs. Irrespective of trading volume, in our view, the best way to avoid liquidity risk is to own companies with a solid dividend track record.